Oberstein’s Felsenkirche, the symbol of the city of Idar-Oberstein, is extraordinary and surely the only one of it’s kind in the world. 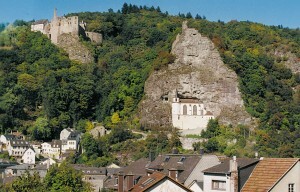 To be sure, there are many chapels and churches in the Nahe and Saar valleys, in the Mediterranean countries, and elsewhere in the world, which are built into or on rocky cliffs. But none of them can claim so many different functions: The Felsenkirche has served as a defence installation and a shelter for the city’s inhabitants, a church for countless worshippers and weddings, and a tourist attraction which with its valuable treasures and works of art, draws around 100,000 visitors per year. According to legend, the interior of the church was chiselled into the rocks as an atonement for a fratricide. But if you glance into the space behind the church, which was first opened to the public in 2005, you will see that there is a natural niche in the rocks. It was here that the Felsenkirche was built in its present from between 1482 and 1484. The church’s special location generates special problems. It is not accessible by car, let alone by truck, and can only be reached via steps or a long footpath. Also, water seepage and falling rocks have repeatedly damaged the church in the course of its history, making extensive and costly renovations necessary. We hope you enjoy your visit to Idar-Oberstein and the Felsenkirche!